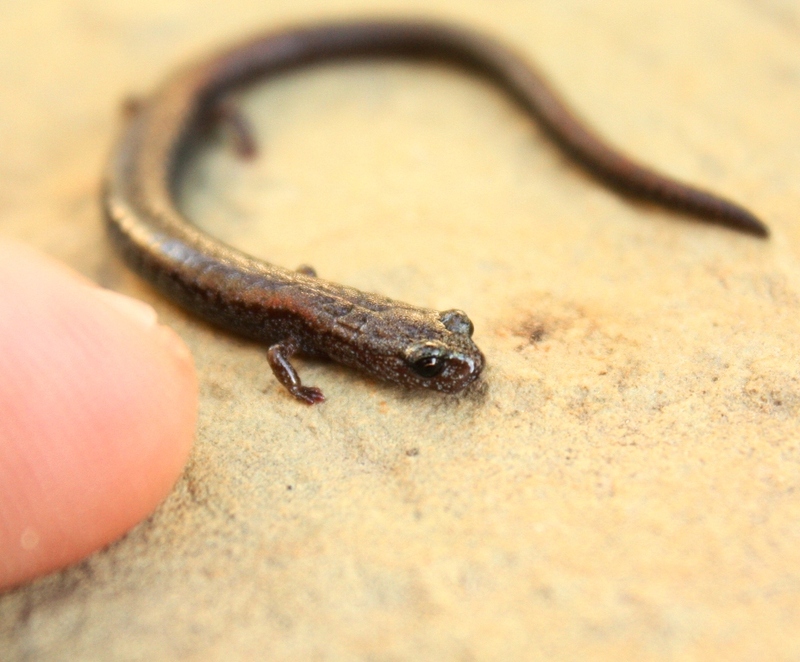 I remember seeing these tiny salamanders around the yard as a kid. They were one of the more intriguing creatures to find and always seemed odd and out of place. They had the puny body of a weird looking lizard and the shiny wet skin of an earthworm. They looked like they needed water, yet always turned up in places nowhere near a creek. I thought they were a salamander, but they didn’t really act like it. Rather than a creekbed and crystal clear water, I have in my head an image of crumbly dark soil and oxalis that I associate with these types of salamanders. I must have come across a lot of them in winter and spring after the rains made the weeds grow. I found this one in my backyard the other day. It turns out that it’s a California slender salamander and they don’t spend any time at all living in water. They rely on rain dampening the land and hide under things like rocks and logs where it is moist and burrow underground as the surface soil dries. This entry was posted in Santa Barbara and tagged Amphibians, Salamander. Bookmark the permalink. I use to see these along one side of my house in Ventura 20 years ago when moving rocks, logs and things. Very cool. Did not know there name. Thanks!! supposedly its the only salamander to have 4 toes on its hind feet, all others have 5. Did you count them? Slender Salamanders can be tricky to ID! In Santa Barbara County, you most likely encountered a Black-bellied Slender Salamander (Batrachoseps nigriventris). It’s always a treat to encounter these cryptic salamanders. Thanks for the post!